I may not have experienced much of Squaresoft's, er, Square Enix's landmark RPG, Chrono Trigger, yet, but that doesn't mean I lack an appreciation for it. 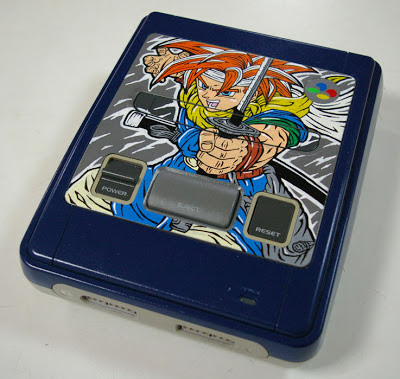 That's due in large part to its appealing cast of characters, of course--one of which serves as the focal point of artist OSKUNK's latest custom creation (the Super Famicom you see in the photo below). To be honest, I wish a few of Chrono Trigger's other central characters--namely Frog, Lucca and Robo--were included, too, but as the saying goes, beggars can't be choosers. For the curious: a few more shots of this custom-painted console (as well as its similarly custom-painted controller) can be seen on OSKUNK's blog. OMG I love his/her work! This SNES looks so great! I agree, Lizzi. Have you checked out the other consoles/handhelds he's painted? I especially love the Dreamcasts. Yes I did. I think I told you before in an other post you made about it earlier. I would looooove to get this Jet Set Raio Dreamcast. Just great! Oh, yes, I'm sure you did tell me before--as I've definitely written about his stuff before now. I think my favorite might be the Samba de Amigo one, although the Jet Set Radio one is awesome, too.